Ease of breathing is the essence of this reg system -- and it looks good too. For 2016 this solid reg system benefits from another substantial upgrade with the addition of the MK25 EVO, featuring SCUBAPRO's patented Extended Thermal Insulating System (XTIS). This exclusive engineering advancement lets you enjoy an ultra-fast breathing response, instant delivery of air on demand, great sensitivity and extra-high airflow - regardless of how cold the water is. The XTIS makes this possible by fully isolating the mechanical elements of the first stage from the cold, increasing its freezing resistance 30 percent over the current MK25 without compromising breathing performance. This makes the MK25 EVO the ultimate do-it-all first stage for all water temperatures. Like the MK25 EVO first stage, the air balanced S600 DEEP BLUE TITANIUM CORE is a special second stage. It features an interior titanium barrel for lightweight performance and additional corrosion resistance. The S600 DEEP BLUE TITANIUM CORE delivers effortless inhalation and exhalation. It's easy to use too, with efficient user controls that include a powerful purge, an inhalation effort control knob and Venturi Initiated Vacuum Assist (VIVA) dive/pre-dive switch. 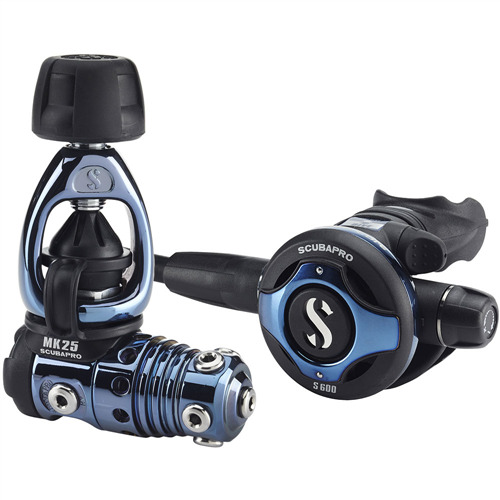 Synonymous with SCUBAPRO quality and unbeatable engineering, the MK25 EVO/S600 DEEP BUE TITANIUM CORE is the preferred combo of many dive professionals. In all water temperatures, in the most demanding dive conditions, this reg performs flawlessly, and it looks great doing it. Jewel colored Deep Blue PVD exterior finish provides superior scratch and corrosion resistance. Air-balanced flow-through piston design delivers constant and effortless airflow unaffected by depth, tank pressure, or breathing rate. Patented XTIS (Extended thermal Insulating system) fully insulates the inner mechanism from the environment, improving cold-water resistance by 30% and delaying ice formation in extreme cold-water conditions without com- promising breathing performance. Key insulation system components are visible in blue. Two opposing high pressure ports allow you to position the first stage pointing up or down. This enables you to run gauges on the right or left side, plus it increases the freedom of movement for head and neck. Five high-flow low pressure ports on a swivel turret maximize hose routing options. High flow ports deliver about 15 percent more air than conventional ports. External intermediate pressure adjustment enables technicians to fine-tune performance quickly and easily without the need for disassembly. Precision molded carbon fiber and technopolymer housing is lightweight and offers cold-water and corrosion resistance for long life. A full titanium interior barrel makes second stage super lightweight and resistant to corrosion. Full metal valve housing is able to withstand years of aggressive diving. Airflow at 2900psi: 1850 l/min - 66 SCFM.